A massive eruption on the surface of the sun this week blasted out a wave of super-hot plasma so high that it could tower over 20 Earths, NASA officials say. The New Year's Eve solar eruption occurred Monday (Dec. 31) and was captured on camera by NASA's powerful Solar Dynamics Observatory, a sun-watching spacecraft that constantly records high-definition video of our star. The result: an eye-popping video of the New Year's Eve sun storm. Despite its size, the solar eruption was not the most powerful example of the sun's stormy wrath, NASA officials said. "Magnetic forces drove the flow of plasma, but without sufficient force to overcome the sun's gravity much of the plasma fell back into the sun," NASA officials wrote in an image description today (Jan. 4). "The length of the eruption extends about 160,000 miles [257,495 kilometers] out from the sun. With Earth about 7,900 miles [12,714 km] in diameter, this relatively minor eruption is about 20 times the diameter of our planet." Some NASA officials described Monday's sun eruption, which occurred over a four-hour period, as a solar ballet. The Solar Dynamics Observatory is one of several spacecraft that keep a constant watch on the sun for flare and storm activity. The sun is currently in an active phase of its 11-year solar activity cycle and is expected to reach its peak level later this year. However, NASA scientists have said that the peak of the current cycle, known as Solar Cycle 24, may be the lowest of its kind in a century. Solar flares and eruptions can have a significant impact on Earth when they are aimed at the planet. 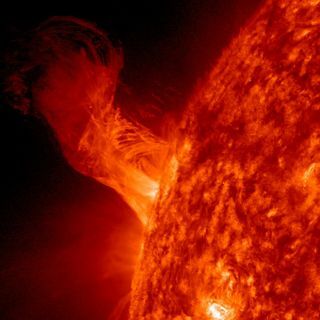 The most powerful solar flares can interfere with satellite communications, pose a safety risk for astronauts in orbit and damage power system infrastructure on the planet's surface. Minor solar storms can also trigger amazing geomagnetic storms above Earth that supercharge the planet's aurora displays above its poles.